The fantasy field is overpopulated with assorted Supermen and those who, at the drop of a Bergenholm, sally forth to save civilisation from a fate worse than death. (It may be Fifth Columnry, but the dreadful thought has occurred to me of late that it might be better for all concerned if Boskone won). And were it not for their inevitably high mortality rate, the Unfortunates - those who tangle with the dark forces of superscience - or the supernatural and come off second best - would hardly find standing room. Like all good clowns, Mr. Joseph Jorkens is essentially human. No Leader of forlorn hopes he, no Saviour of the race. But if we were exposed to the perils to which Mr. Jorkens is so well accustomed it is doubtful if we should survive. Only the clowns have the ability to amble on, all unconcerned, while the world crashes about their ears. Add to this ability a certain shrewdness, a whole-hearted devotion to the interests of Mr. Jorkens, and you have the secret of his indestructibility. He survives-not, perhaps, with honour or glory, but he survives. And that, in these times, is something. The Jorkens stories are fantasy, but not in the sense that some of Dunsany’s earlier works are: his tales of strange lands and peoples and their gods. Others have ploughed that furrow, without the same skill as he. The results of their efforts-the horror, like manure, piled on with a shovel-has been a rank jungle of fantastically uncouth verbiage through which the struggling reader must hack his way with a machete, emerging haggard and delirious, babbling some gibberish about a goat with a thousand young. The light touch is lacking, and without it writing of that kind is as absurd as the Gothic romance of the last century. But it is in the Jorkens stories that the light touch comes into its own; the light touch, and the Outrageous punch line-except that it is never irrelevant, is always true to the frailties of human nature. That is one of the stories, one plot all too familiar to the science fictioneer, handled in Dunsany’s own inimitable way. And there is a Voyage to the Other Side of the Sun. There is a Message to Mars (Pythagoras’ Theorem done in bonfires on the Sahara), and the reply. There is a Dreadful Warning against the misuse of atomic power. 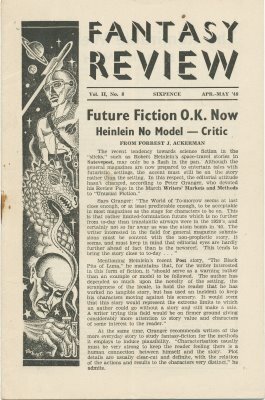 The idea behind that one has been used by both Mr. Heinlein and myself— but we hadn’t Mr, Jorkens to give it that wry kink to its tail. Haunted woods, deals with the Devil, battle, murder and sudden death-Jorkens comes through them all, tells the tale in his easy, anecdotal style, trots out the last sentence that could well be by Shaggy Dog out of O. Henry. And yet, there is an essential seriousness; the essential seriousness of the good jester who is far more in tune with the tragedy of life than all the prophets of doom, all the professional purveyors of sackcloth and ashes will ever be. But don’t let that worry you. There are thirty-three stories in the book and, by my count, twenty-eight good laughs. You may find more.